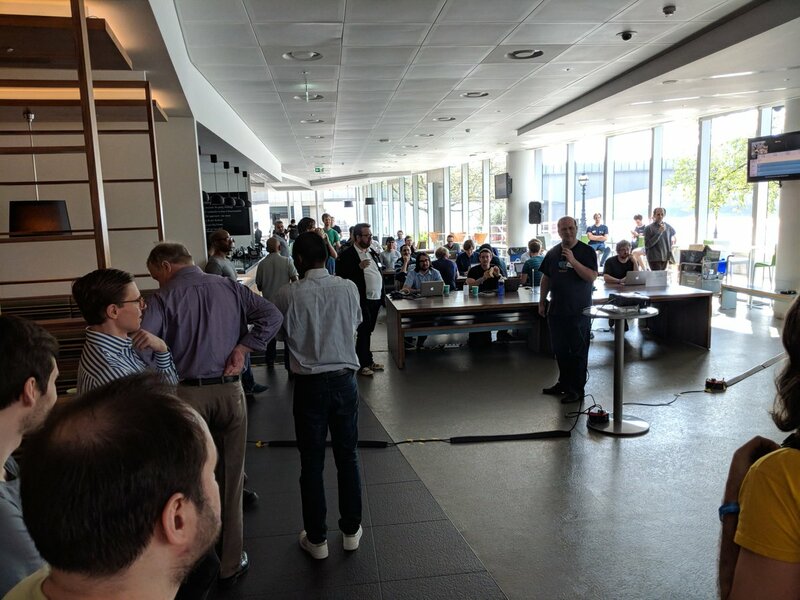 This weekend we ran PyDataLondon 2018, the fifth iteration of our conference (connected with our monthly PyDataLondon meetup). This year we grew to 500 attendees! 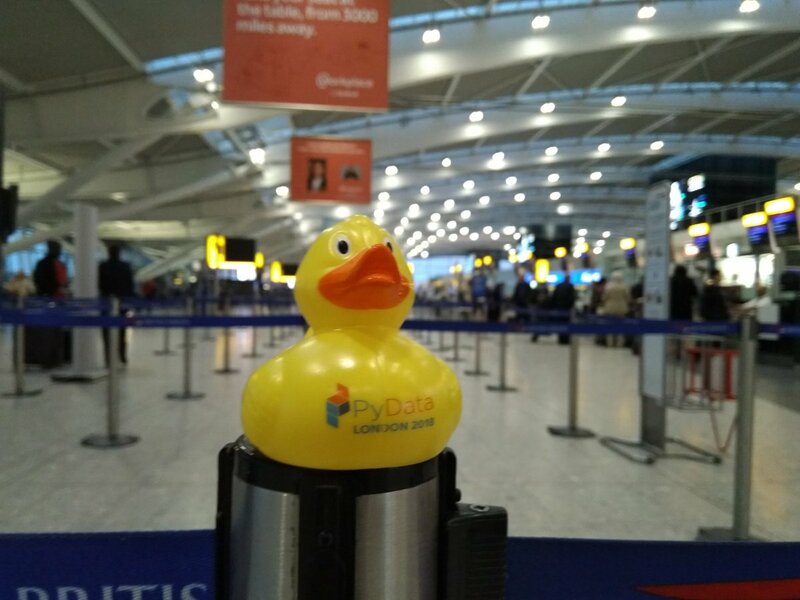 Read about the past PyDataLondon 2017 here. Updates – videos are online, reportedly we raised £91,000 towards open source support for NumFOCUS via ticket sales & sponsorship (all the London team are unpaid volunteers, this money goes back to NumFOCUS to support the PyData ecosystem). Three new chair persons – Marco, Cecilia and Florian – thanks for making the conference so great! Look here for many more photos! On Thursday morning I co-ran a “Make your first open source contribution” with Nick (of PyDataEdinburgh). We had a group who’d rarely (or never) made a contribution to github. We managed to commit a couple of minor doc fixes, recreated a bug in ELI5 and subsequently a new (failing) test was submitted to the project. Great success! I’m interested in another bug if you want to make a contribution. One of our key NumFOCUS organisers is Leah Silen, she’s an unsung hero who makes every conference come together. She broke her foot recently and couldn’t fly over. It turns out the crowd rather misses her and all of her work. Get well soon! At the conference I spoke on “Creating Correct and Capable Classifiers” (worked Notebook in my github repo, full video online). We took a look at starting with a baseline model, building a better stable model, visualising errors, diagnosing where it might be failing and explaining the end results to a colleague. Wonderful talk by @ianozsvald at PyData London 2018, lots of great insights showing how to create capable classifiers. 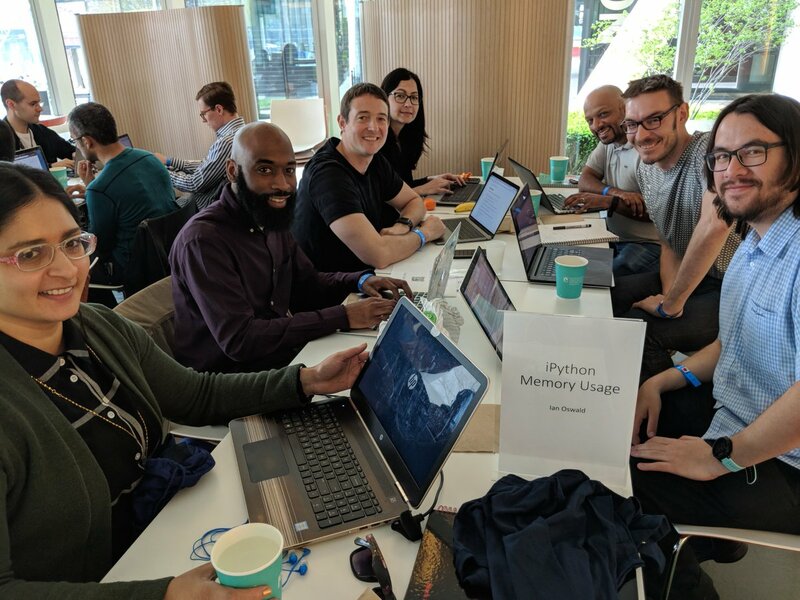 Yesterday I got to attend Man AHL’s first London Python Data hackathon (21-22 April – photos online). I went with the goal of publishing my ipython_memory_usage tool from GitHub to PyPI (success! ), updating the docs (success!) and starting to work on the YellowBrick project (partial-success). This is AHL’s first crack at running a public Python hackathon – from my perspective it went flawlessly. 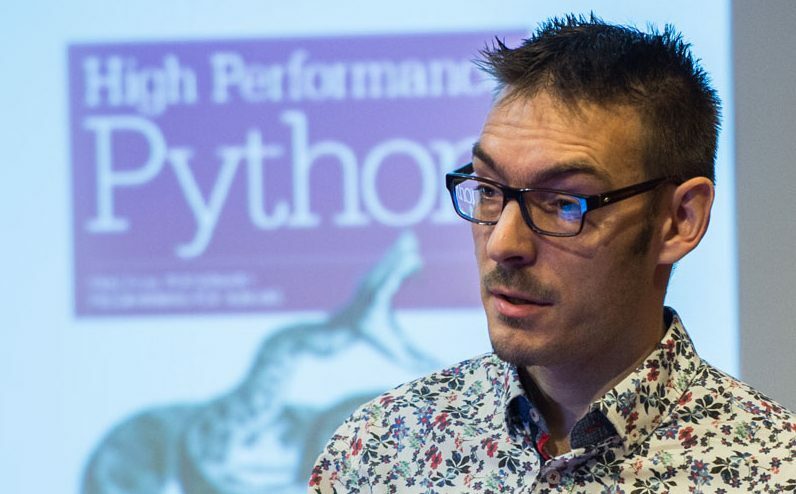 They use Python internally and they’ve been hosting my PyDataLondon meetup for a couple of years (and, all going well, for years to come), they support the Python ecosystem with public open source contributions and this hackathon was another method for them to contribute back. This is lovely (since so many companies aren’t so good at contributing and only consume from open source) and should be encouraged. I (and 10 or so others) then introduced our projects. I was very happy to have 6 new contributors volunteer to my project. I introduced the goals, got everyone up to speed and then we split the work to fix the docs and to publish to the test PyPI server and then finally to the official PyPI public server. Many thanks to Hetal, Takuma, Robin, Lucija, Preyesh and Pav. Robin had recently published his own project to PyPI so he had some handy links. Specifically we used twine and these notes. In addition the Pandas Sprint guide was useful for things like pulling the upstream master between our collaborative efforts (along with Robin’s notes). This took about 3 hours. Next we had a crack at the sklearn-visualiser YellowBrick – first to get it running and tested and then to fix the docs on a recent code contribution I’d made (making a sklearn-compatible wrapper for statsmodels’ GLM) with some success. It turns out that we might need to work on the “get the tests” running process, they didn’t work well for a couple of us – this alone will make for a nice contribution once we’ve fixed it. Overall this effort helped 6 people contribute to two new projects, where 5 of the collaborators had only some prior experience (as best I remember!) with making an open source contribution. I’m very happy with our output – thanks everyone! I’ve been building my data-science jobs list for a couple of years now. Almost 800 folk are on the list, they receive an email update once every two weeks containing around seven job ads. Many active members of PyDataLondon are on the list. The ads are mostly London-based, a few spread into Europe. In addition to the jobs I’ve added a “book of the month” and “video of the month” recommendation along with an open source project that is after contributions from the community. If a selection of jobs and educational recommendations every couple of weeks feel like a useful addition to your inbox – join the mailchimp list here. Your email is never revealed, you’re in control, you can unsubscribe at any time. Companies who have advertised include AHL (our host for PyDataLondon), BBC, Channel 4, QBE Insurance, Willis Towers Watson, UCL and Cambridge Universities, HAL24K, Just Eat, Oxbotica, SkyScanner and many more. Roles range from junior to head-of-dept for data science and data engineering, most are permanent roles, some are contract roles. Anyone can post to the list, PyDataLondon members get to make a first post to the list gratis (I take the time cost as a part of my usual activity of community-building in London). All posts come via me to check that they’re suitable, they go out every two weeks for three iterations. Contact me directly (ian.ozsvald at modelinsight dot io) if you’re interested in making a post. I’m back at BudapestBI and this year it has its first PyDataBudapest track. Budapest is fun! 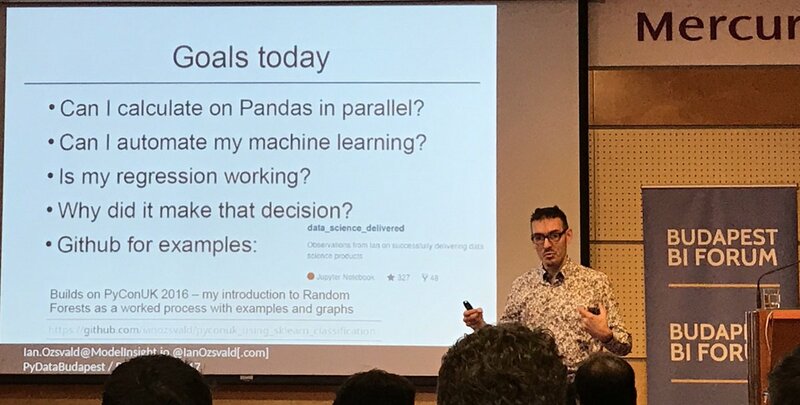 I’ve had a second iteration talking on a slightly updated “Machine Learning Libraries You’d Wish You’d Known About” (updated from PyDataCardiff two weeks back). When I was here to give an opening keynote talk two years back the conference was a bit smaller, it has grown by +100 folk since then. 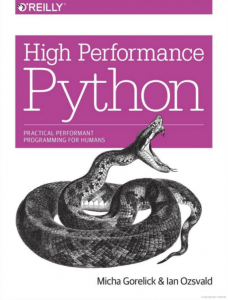 There’s also a stronger emphasis on open source R and Python tools. As before, the quality of the members here is high – the conversations are great! Some audience members asked about co-linearity detection and explanation. Whilst I don’t have a good answer for identifying these relationships, I’ve added a seaborn pairplot, a correlation plot and the Pandas Profiling tool to the Notebook which help to show these effects. I’m planning to do some training on these sort of topics next year, join my training list if that might be of use.